So Who Are The Bursledon Village Band ? 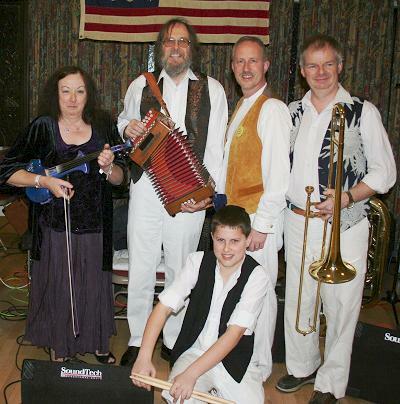 The Bursledon Village Band was originally formed in 1977, mainly to play for local barn dances but also to keep Dave Ingledew the melodeon player out of mischief. Bursledon is a little village just to the East of Southampton and the initial rehearsals were held in the local pub, "The Jolly Sailor". At that time most of the band lived in Bursledon, we played Village music, hence the name. Since our initial barn dance for a Church Social in Bursledon Village Hall we have played for over 1,500 dances in places as diverse as village halls, pubs, marques, school halls, hospitals and even the South Bank Centre in London. We have played for Folk Festival Ceilidh's, Dance Club Ceilidh's, Mayor's appeal charity barn dances, wedding receptions, anniversaries, birthdays, Christmas parties and Folk Clubs. We've also appeared on Television and local and national Radio. Our choice of tunes has always been biased towards the Southern English repertoire as we find them so much more interesting, but we don't pass up a good tune if it comes from some other part of the world. If it's good to play and to dance to then just like the old musicians, in whose footsteps we tread, we add it to the repetoire. Over the years various band members have come and gone but Dave Ingledew on Melodeon and Joyce Ingledew on Fiddle have provided the core melody since the band started. Currently they are augmented by Andrew Purkiss on Keyboard, Robert Purkiss on Drums and Pete Theobald on Tuba and Trombone. Click on an image below to find out more about each band member.